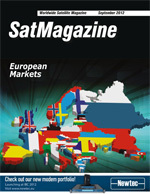 For a number of years, SatMagazine.com has highlighted the potential impact of 4000-line and 8000-line satellite TV transmissions, generally referred to as Ultra-HDTV (and 4K and 8K). This prescience has come into sharper focus these past few weeks given the statements from the likes of DirecTV and Europes SES, and in particular comments recently made to analysts by SES CEO Romain Bausch. Europe is currently the largest geographic market for FSS satellite operator revenues, representing close to 30 percent of global satellite capacity leasing income. Jacob Keret brings to his position more than 20 years of global business and management experience in the aerospace and telecommunications arena. Jacob served for six years as vice president of marketing and sales at Starling Advanced Communications, an innovator in satellite communication systems. Prior to that, Jacob co-founded Spacecom Satellite Communication Services, a service provider for AMOS satellites. Counterfeiting: The Risk To Satellites, By Rory King, Director, Supply Chain Management, IHS, Inc. In space, no one can hear you scream. However, if a satellite fails in space due to the inclusion of faulty counterfeit parts, everyone on Earth will hear the screaming as recriminations fly to and fro about the loss of a multimillion-dollar project. For the eleventh consecutive year the satellite industry will be converging on New York City for the SATCON exhibition and conference November 14 and 15 at the Jacob Javits Convention Center. You dont have to be a fly on the wall to pick up on the industry buzz over Ka-band. The mere mention of Ka at any fraternal satcom gathering is certain to spark a spirited debate riddled with viability pros and cons. David Gelerman founded Advantech Wireless in 1988, serving initially as President and, since March 2006, as Chief Executive Officer. Simen K. Frostad is Chairman and a co-founder of Bridge Technologies. With 22 years of industry experience, Simen founded Bridge Technologies in 2004, after creating the worlds first IP/MPLS contribution network for Scandinavian sports coverage. Tina is a shareholder and director of Cavendish Trust with responsibility for a portfolio of international clients as well as joint responsibility for most of Cavendish Trusts internal functions. as well as an emphasis on business development, marketing and personnel. Colem supplies monitor and control systems to major broadcasters and news agencies bringing new Network Management System (NMS) technologies to these demanding users. European Markets Roundtable: Andy Tafler, Vice President, CPI International, Inc.
Andrew E. Tafler became a Vice President of CPI in December 2005. Prior to this Mr. Tafler was Division President of the Satcom Division in May 2004, and previously his title was Vice President of Operations for the Satcom Division from 2000 to 2004. Eric Béranger, CEO of Astrium Services, is the Chairman of the European Satellite Operators Association (ESOA) board. ESOA represents some of the largest satellite operators in the world, including Astrium Services, Avanti Communications, Eurasiasat, Eutelsat, HellasSat, Hispasat, Inmarsat, Intelsat, SES, Telenor and Telespazio. EMP offers high quality access to all satellites in the 45 degrees West to 90 degrees East range, blanketing Europe, the Middle East, Africa, the Americas and Asia. Mr. Leichner has more than 20 years of marketing and management experience. He is responsible for corporate marketing and business development at Gilat and its subsidiaries. Jorge Potti is responsible for all GMV Aerospace operations worldwide and manages a large multinational team of more than 500 professionals. Dean Griffler is the Senior Vice President for Global Sales at iDirect. Our business model is based on providing technology exclusively for our partners satellite networks. European Markets Roundtable: Jean-Philippe Gillet, Regional V.P. Europe, Intelsat S.A.
Mr. Jean-Philippe Gillet is responsible for leading Intelsats sales effort in Europe and the Middle East. Bruno Dupas is President of Kratos Integral Systems Europe based in Toulouse, France. Kratos has been a leader in ground systems products and solutions in the EMEA region and around the world for more than a decade. Martin A. Kits van Heyningen, one of KVHs founders, has served as president and a director since 1982, as chief executive officer since 1990, and as Chairman of the Board since July 2007. European Markets Roundtable: Howard Hausman, President + CEO, MITEQ, Inc.
Howard Hausman directs the four divisions of the corporation, Microwave Electronics Components and Systems, Microwave Amplifiers, Satellite Communication Systems, and Microwave High Power Amplifiers. Newtec was founded 27 years ago in the heart of Europe by two engineers whose vision has produced a satcom company with more than 300 employees in five continents. David Furstenberg is Co-Chairman of the Board for NovelSat. The company is focused on maximising satellite bandwidth within the broadcast, telecommunication and military sectors. Mr. Baugh serves as the President and Founder of Northern Sky Research (NSR), which he created in 2000 to provide independent, actionable market research and consulting services to the satellite industry. Ofer Greenberger joined Orbit in April 2012, bringing with him over 20 years of international business management experience within the hi-tech industry. Peter Guggenbach is CEO of RUAG Space, which has an annual turnover of around 300 million Swiss francs and 1,150 employees. He is president of the Swiss Space Industries Group (SSIG) and a member of the board of Aerosuisse, umbrella organisation of Swiss aviation and space related companies. David Hochner has been the CEO of SatLink Communications since 1995. At SatLink, David lead many large scale projects including teleport build up in Cyprus, a new Satellite DTH company in Japan, including rights management, and acted as an advisory for the Philippines Cable Company in Manila for ABS-CBN. Jacob Keret brings to his position more than 20 years of global business and management experience in the aerospace and telecommunications arena. Spacecom is the multi-regional satellite operator of the AMOS satellite fleet currently consisting of the AMOS-2 and AMOS-3 satellites.